Flowers are fascinating things. They catch your eye and hold your attention with their vibrant colors. Part of its fascination is how fleeting it is. It withers away after a short time like the beauty of a girl. It makes you appreciate them more because it will soon be over. 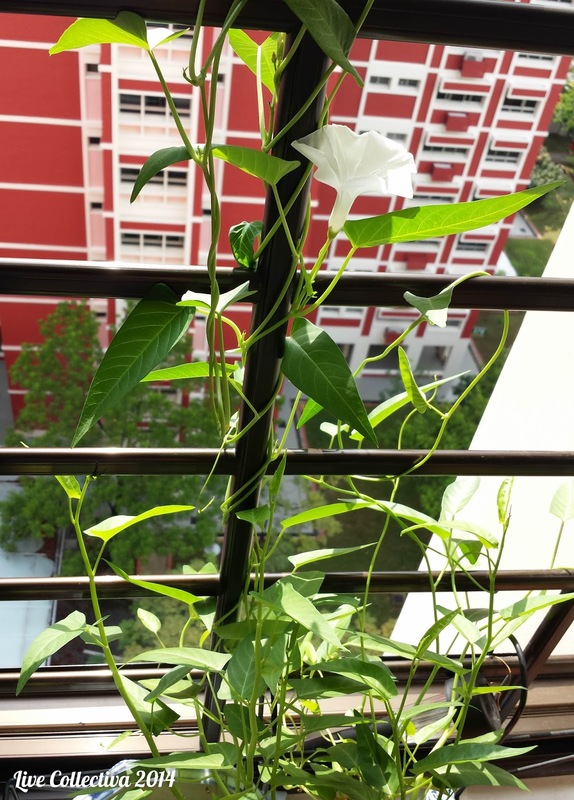 Can you imagine the excitement in the house when the family knew the Kang Kong plant sprouted buds of flower? We held our breaths and waited impatiently. Every night, we discussed and speculated when the flower will bloom. The first flower finally opened on a beautiful Saturday morning. We oohed and aahed as we snapped away with our camera phones. Finally a perfect shot after twenty tries. The flowers of the Kang Kong plant last for only one day. 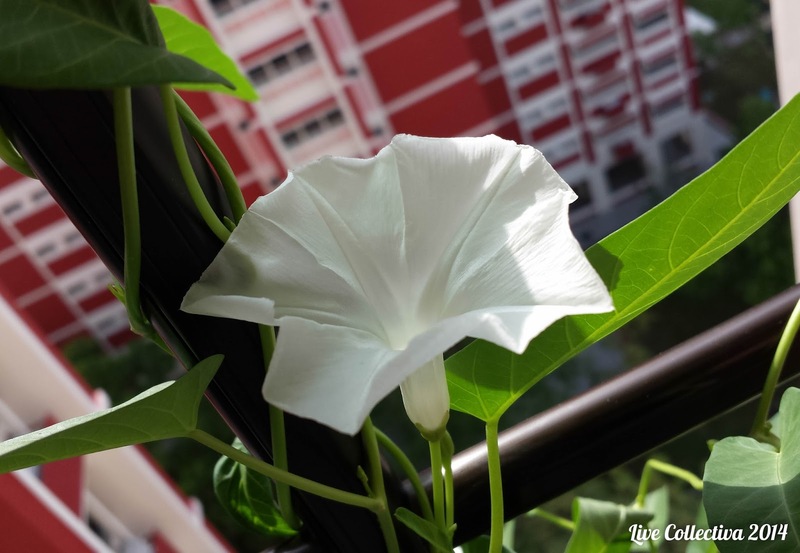 The other name of the Kang Kong is the water Morning Glory - the flower blooms gloriously in the morning and withers by evening. Few flowers have such fleeting moments. The bud starts out fat and elongates over the week. A day before it blooms, the bud reaches a length of your index finger. You can see ridges that spirals around the bud. On the morning of the bloom, the spirals starts unfurling at 7 am. It's amazing that the plant is aware of the sun rise. By 8 am, the spirals unfurls even more as the golden sun rays hits the plant. When the sun is out in full at 9 am, the flower opens and continues to enlarge until 12 pm. Mid-afternoon is peak of the bloom and the flower starts to shrink. The shrinking accelerates towards the late afternoon and eventually looks like a crumpled tissue. 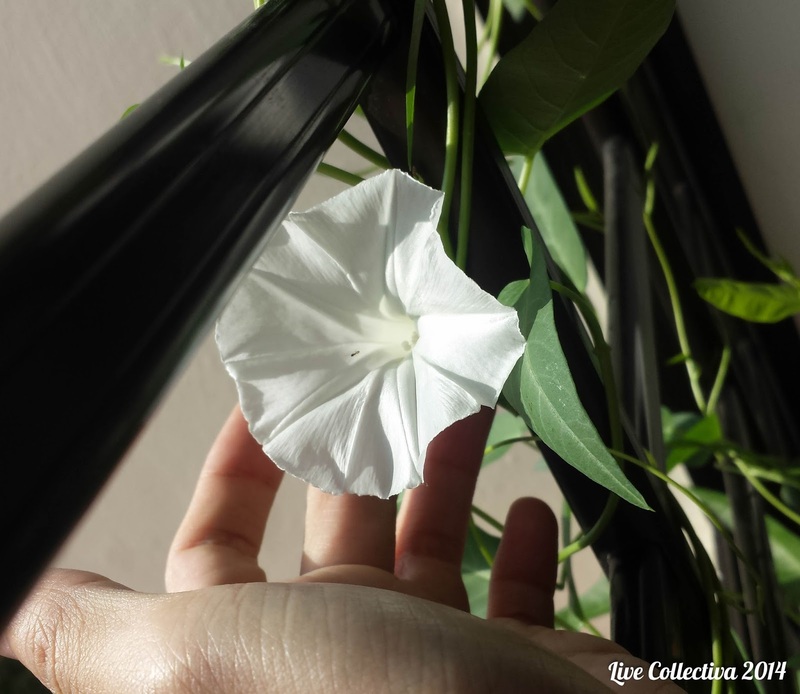 So girls, if you ever receive a bouquet of Morning Glories, your guy has put in a lot of effort. This is a very difficult flower to capture the moment of bloom. The golden ray of the Sun at 8am is spectacular. To capture the bloom in stages, I staked out the next flower. The Kang Kong plant had six more blooms over several weeks. The withered flower becomes a fruit after a week. Only some flowers successfully makes it to the next stage. You can tell the flower is fertilised when the base of the flower begins to swell. 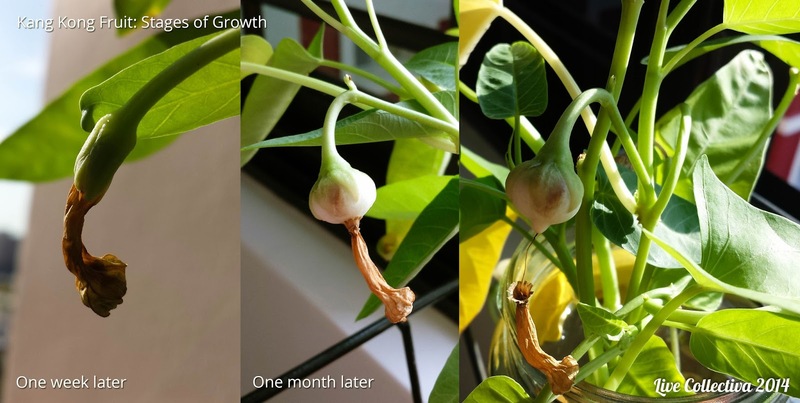 The fruit grows bigger each day until it becomes a bulb that is the size of a finger tip. The dried flower petals dangles at the bottom of the fruit. The Kang Kong fruit is pale green and white. The base of the flower is swollen and it has kept it's petals. The petals will fall off quickly if the flower is not fertilised. The leaves and stems are edible. I snipped some off and my mum cooked me a noodle dish with fresh Kang Kong leaves. 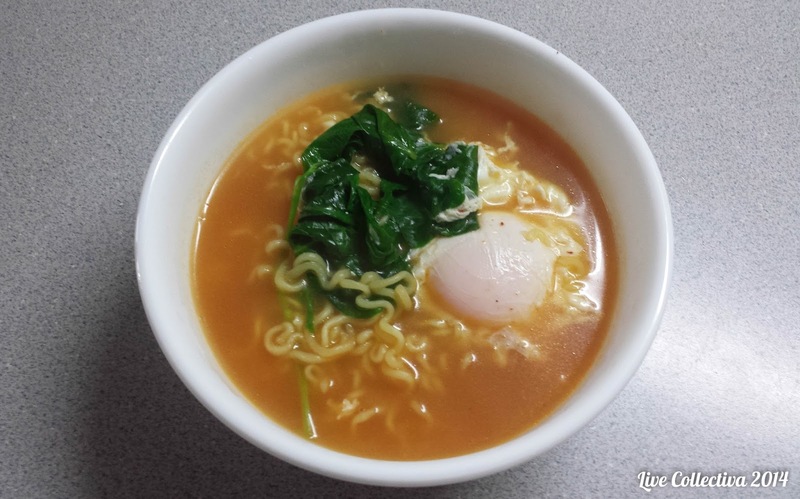 It was tender and crunchy at the same, subtly different from what I normally taste. Delicious. Maybe as sambal kang kong dish next time. 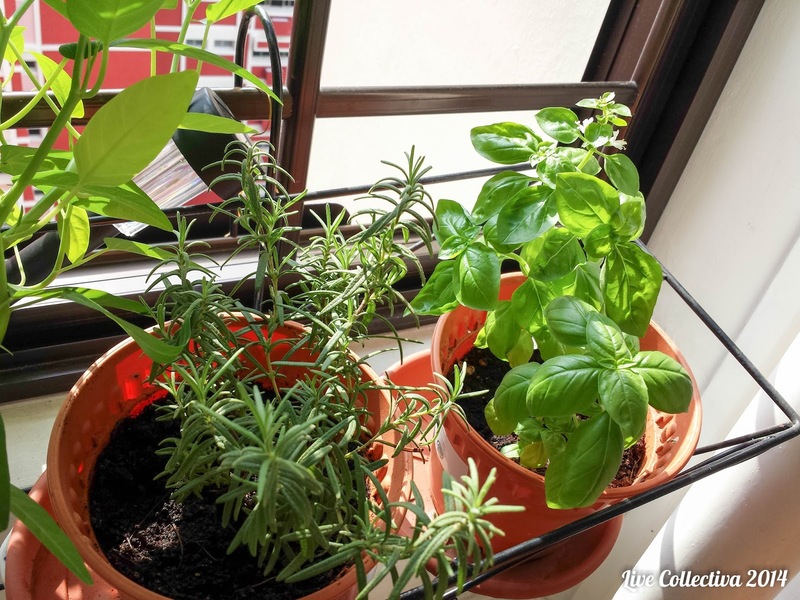 I have been doing planting in my balcony for a while now. 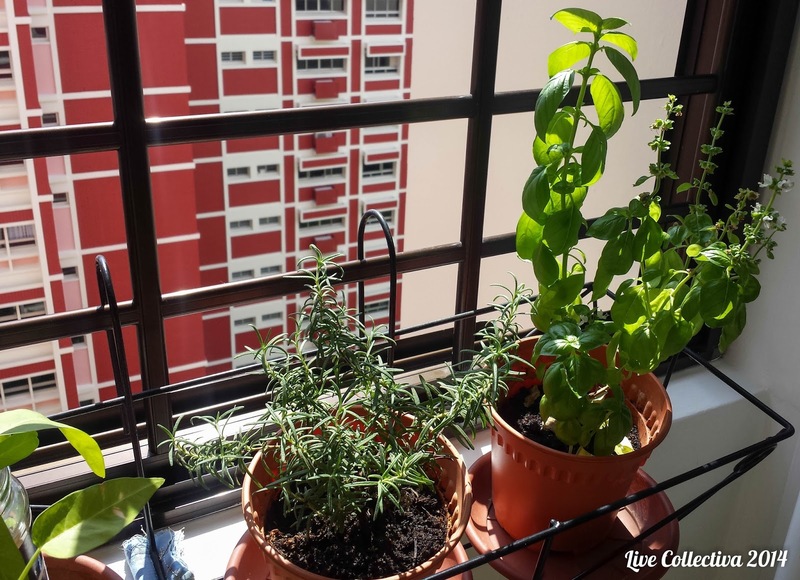 Back in March, I wrote about my herb garden (See "Planting Herb Garden in Urban Singapore Apartment"). 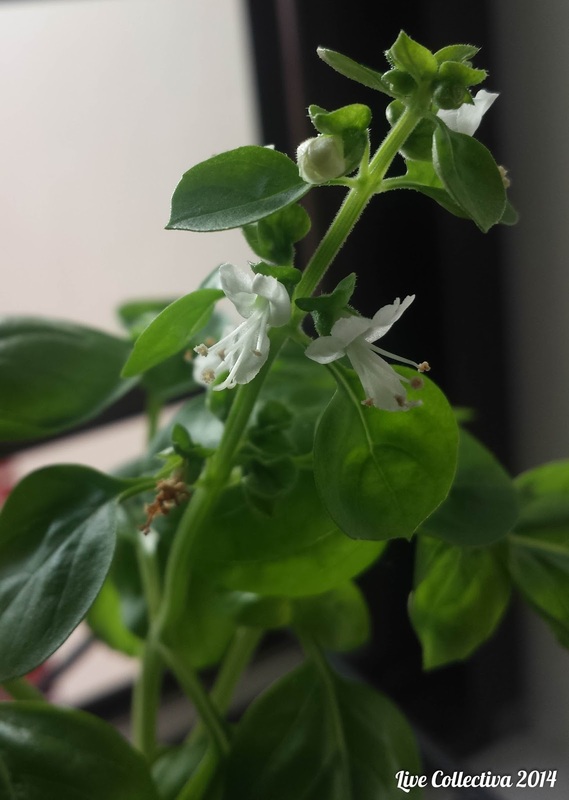 A few months after that, my sweet basil got infected with a fungus that I am too inexperienced to identify. In a last ditch attempt to save it, I cut off the remaining healthy stems and stuck them into a jar of water. If you want to do this, I recommend a clean pen knife and search online for a stem cutting guide. After a few weeks, white roots sprouted at the base of the stem and I transplanted them into soil. Only two out of the four stems survived the transplant. Amazingly, one of the them flowered. You can tell the tip of the stalk is a flower bud by the tiny leaves. There are three of them in this picture. 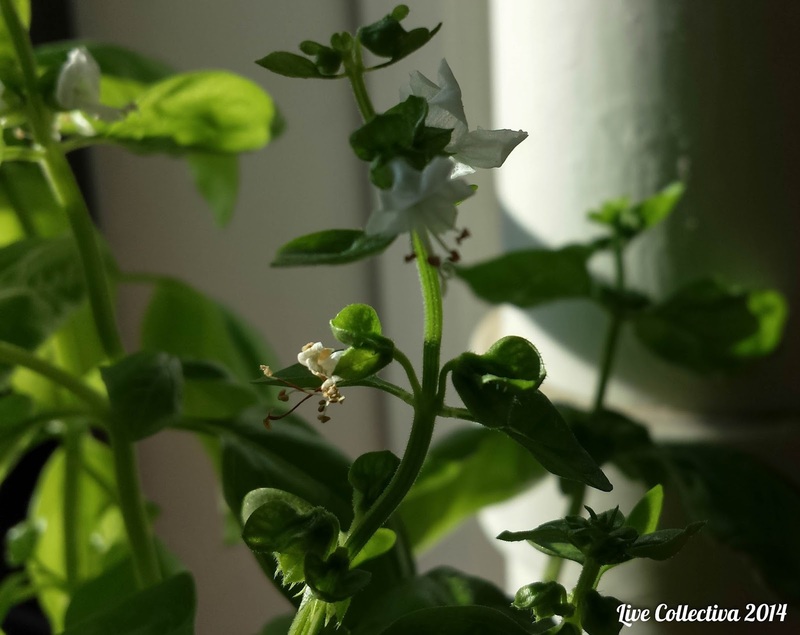 Sweet basil's flowers are tiny and white. They come in quadruplets on a single node in the stalk. The buds take turns to bloom every other day and each bloom lasted for a week to two. 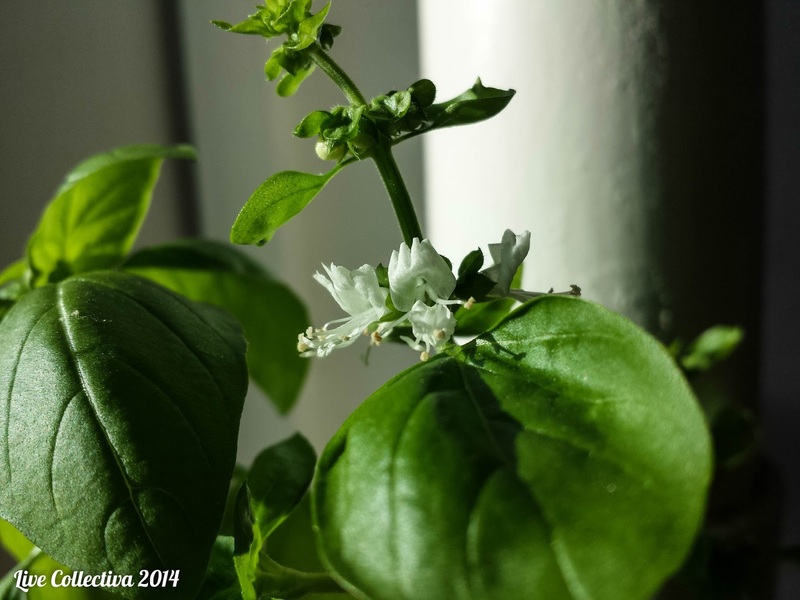 Once my sweet basil plant started flowering, it could not stop. All the stalks are covered with flowers at every nodes. Some of the flowers eventually become fruits. The flowers grows at each node of the stem where the leaves usually are. Photobombed by the Rosemary plant in the foreground. 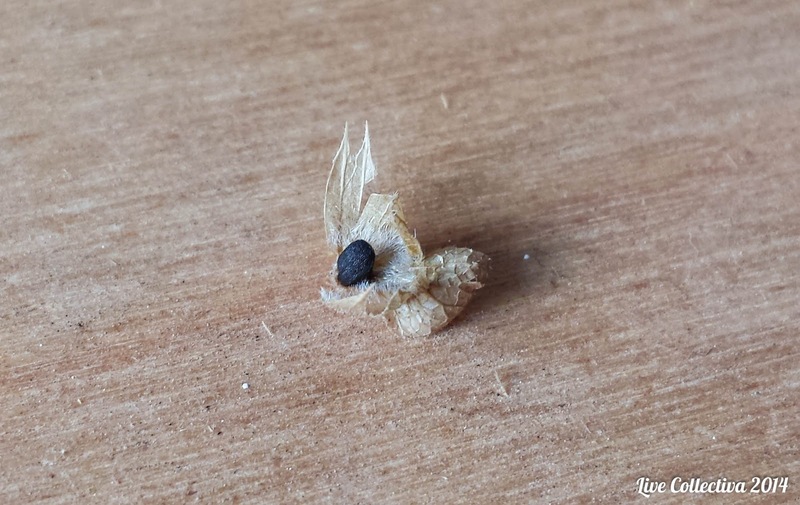 At first, I had no idea how a sweet basil fruit or seed looks like. When the flower withered, it left a brown stub. I snipped it off and pushed it into the soil which I always do with fallen leaves. 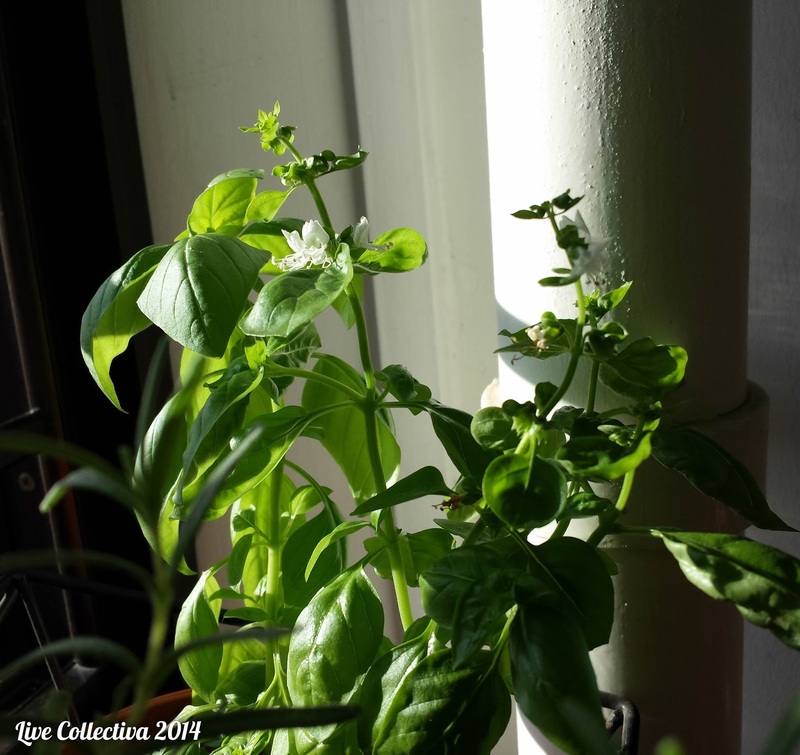 Unexpectedly, two sweet basil seedlings pushed their way out of the soil a few days later. It turned out the dry stub contained a seed. On closer observation, I can identify the fruits as being a greenish-brown husk from the remains of the flower base. Under strong sunlight, the seed casts a black outline against the wall of the husk. Slicing the husk of the fruit, you get a black seed. It's actual size is very small, about the size of an ant. 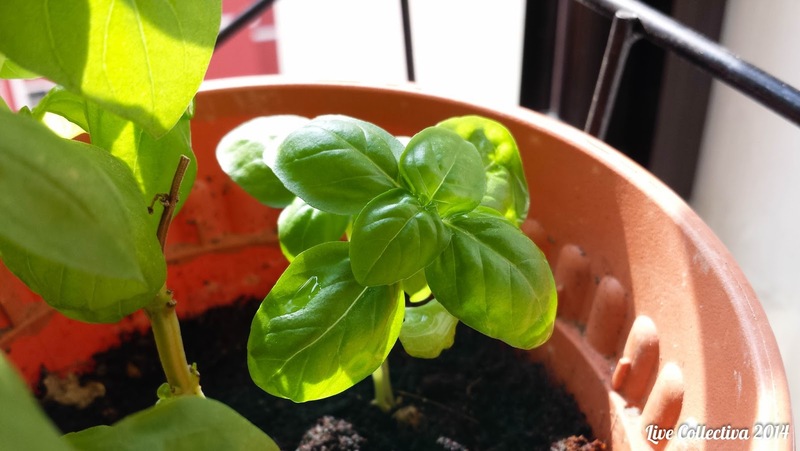 The leaves of the sweet basil seedings are paw-shaped with no leave veins. They bear little resemblance to the adult leaves. Right now, my seedlings have grown up to healthy small-sized plants. As for the remaining seeds, I am keeping them for the future. 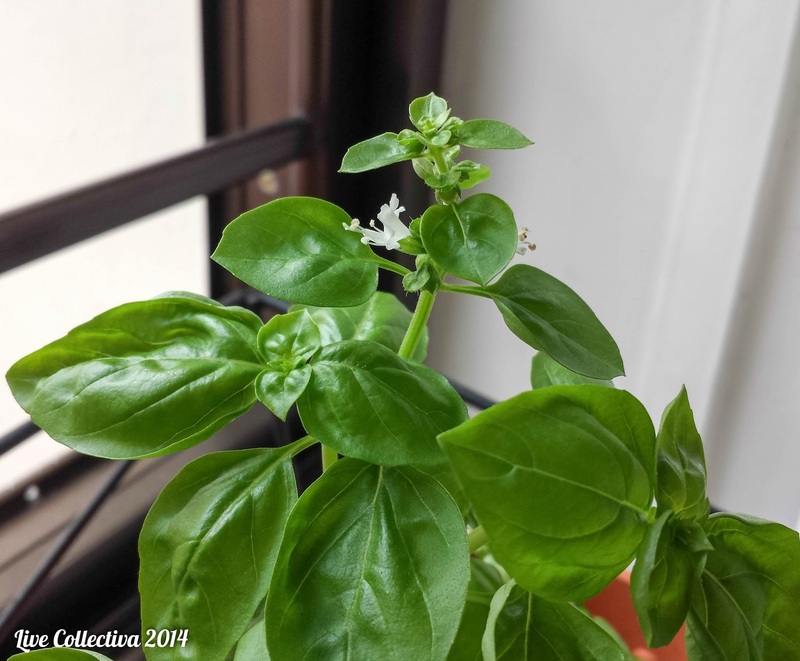 A mini sweet basil plant. If you look closely, you can see the paw-shaped starter leaf at the bottom. The sweet basil was originally meant to supplement my cooking. After witnessing it's reproduction cycle, they intrigued me and made me care for them more. I can't deny the fact that those pretty flowers have tugged on my heartstrings. Even more, I am amazed how a tiny seed unleashed a seedling and became a plant. I know our parents taught us this basic knowledge: a plant comes from a seed. It's just that my recent experience has left me marvelling at the design of nature. If you cannot relate to what I am saying, try this the next time you look at a huge tree: imagine the small fragile seedling it used to be. Then think about how it's branch can crush you if it were to fall on you. Nature is a sight to behold and a force to be reckoned with, isn't it. I leave you with more photos because they are simply irresistible. I have written short annotations for each photo so you can learn a bit while viewing them. Enjoy. The bud at the top is swollen. It will bloom tomorrow. The tiny white dust are the pollens. 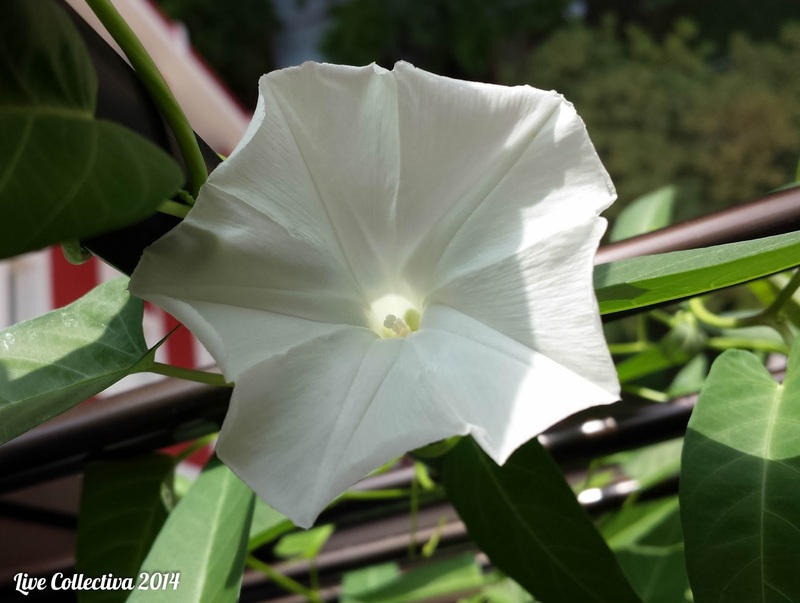 The stigmas are T-shaped white stalks: only one per flower. The yellow-headed stalks are its filaments. The stigmas are actually visible in this photo but very hard to point them out. This was taken on 9 Nov 2014. At the bottom of the the sweet basil pot is another transplanted stalk that survived. Growing beneath it are the two seedlings. See how small they are? See the next photo. This is taken today 13 Dec 2014. In one month, it is towering over the flowering stalk. The seedlings have doubled in size too. The Rosemary has hardly changed. The Kang Kong is a creeper plant. It twirled itself against the window grill on its own. Can you see it twirling against it's own stem? The ants love the nectar. They are constantly in and out of the Kang Kong and Sweet Basil flowers. They are probably the ones that fertilise the flowers.